Finally, a collection that celebrates, considers, contemplates, even criticizes’midlife’ from a black woman’s point of view. Age Ain’t Nothing but a Number ranges over every aspect of black women’s lives: personal growth, family and friendship, love and sexuality, health, beauty, illness, spirituality, creativity, financial independence, work, and scores of other topics. Midlife today isn’t your grandmother’s’change of life.’ Today, black women call hot flashes ’power surges,’ and menopause, the ’pause that refreshes.’ These days, middle-aged women may be newlyweds or new mothers, as well as grandmothers or widows. They may experience the empty-nest syndrome and then the ’return-to-the-nest syndrome’ as adult children move back home. They may navigate the field of Internet dating, travel the world, teach homeless women, take up pottery, or study international business. This anthology captures all of these aspects of midlife as experienced by some of the finest voices in African-American writing today. 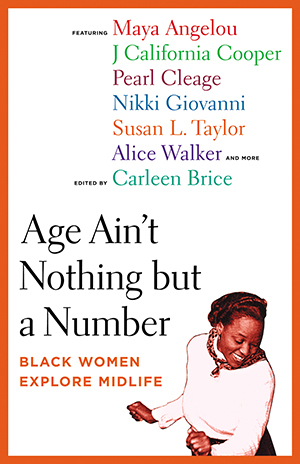 Featuring the work of Maya Angelou, J. California Cooper, Pearl Cleage, Nikki Giovanni, Susan L. Taylor, Alice Walker, and dozens of others, Age Ain’t Nothing but a Number will make readers think, laugh, and cry and will be the perfect gift book for spring.